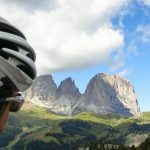 One of the most common reasons why cyclists come to the Dolomites for a cycling holiday is to see our region’s amazing views. 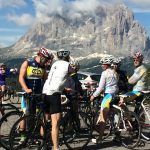 But, when we ask cyclists what they liked best about their rollercoaster ride on the Dolomite Passes, they rarely say, “The views”! We cyclists love suffering and, when we suffer, all we see are drops of sweat trickling onto the road. It’s only at the top of the climb that we enjoy the terrific Dolomite view. So, what do cyclists remember the most? 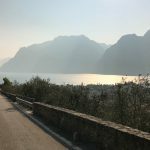 Imagine yourself climbing the Passo Fedaia: will you tell your mates about the lake and the Marmolada glacier at the top or tell them how you struggled up the 2.7 km stretch with a 10-15% gradient? 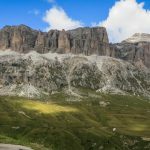 What gives you more adrenaline on the Passo delle Erbe: the view of the Odle Massif or the tiny, never-ending road that winds along luscious meadows and Tyrolean farms? First-time visitors often miss great spots along the ride. 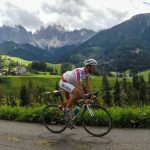 That’s why I created this website: to describe every Dolomite climb – including their secrets – so that, when you’re struggling up a steep gradient, you’ll know when to look up and look around… and have a good excuse to stop and take a picture with a gorgeous Dolomite background. Enjoy browsing… riding through the climb list and hope to see you soon in the Dolomites! 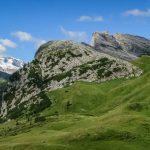 Looking for a climb or route quickly, type in the name of the climb (example: Pordoi), or browse the climbs and routes section below.